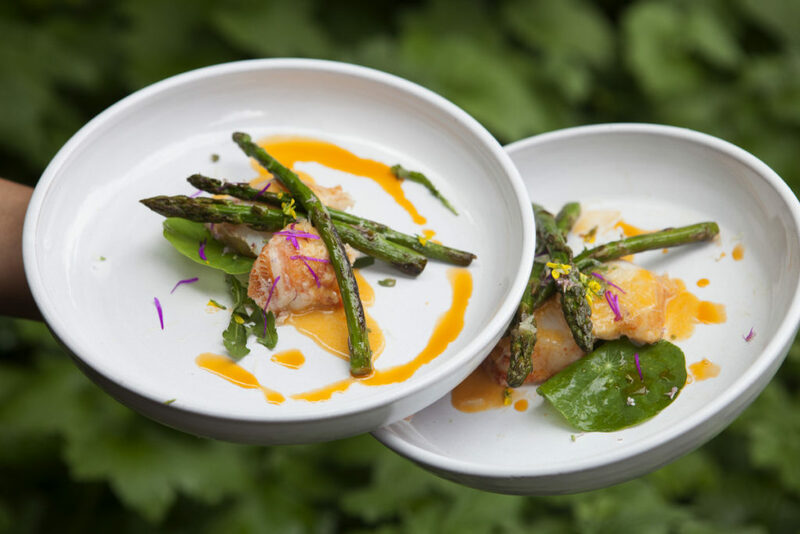 While chardonnay and lobster is a match made in heaven, a zesty Eden Valley riesling will cut through the creaminess of the butter sauce and complement the flavours of the asparagus, finger lime and capers. 1. Remove green tails from shells and place in a zip lock or vacuum bag. Add Agrumato oil and seal bag expelling as much air as possible (using a vacuum bag will ensure tail doesn’t curl and keeps shape). Refrigerate until required – no more than 12 hours. 2. Make sauce as below and keep warm (no hotter than 40°C) and wash greens and pat or spin dry in a salad dryer. 3. Steam lobster tails over boiling water in a colander or bamboo steamer for approximately 5 minutes or until the tail just sets. Remove from the heat and allow to cool at room temperature. 4. Place half the butter in a frying pan with ½ teaspoon lobster oil and sauté asparagus gently until just cooked. Add a teaspoon of lemon juice and sprinkle with caper salt. Remove asparagus from the pan and keep warm. 5. Wipe pan, add remaining butter and another ½ teaspoon lobster oil. Slice lobster into 1 ½ cm slices and cook gently for a couple of minutes to warm tail slices through without them becoming tough. 6. To serve arrange salad leaves on base of plates/bowls. Place a couple of lobster slices on each salad, top with asparagus spears and drizzle lightly with sauce. 7. Scatter with grains of finger limes, herb flowers and capers and finally place a few drops of lobster oil on each plate. Serve immediately while still warm. 1. Place shallot, white wine, fish stock, verjus and citrus juice into a saucepan and reduce to a syrup. 2. Stir well and add the cream. Bring back to a simmer, add lime zest, remove from heat and whisk in butter, a little at a time until completely emulsified. 3. Strain and keep warm.